In an analysis of the world's most valuable brands, Apple ranked among the top companies in generating social media interest on services such as Myspace, Facebook, and Twitter. Social Media Analytics firm Sysomos issued rankings on the amount of online "buzz" generated by twenty of the top companies as determined by international brand consultancy Interbrand. 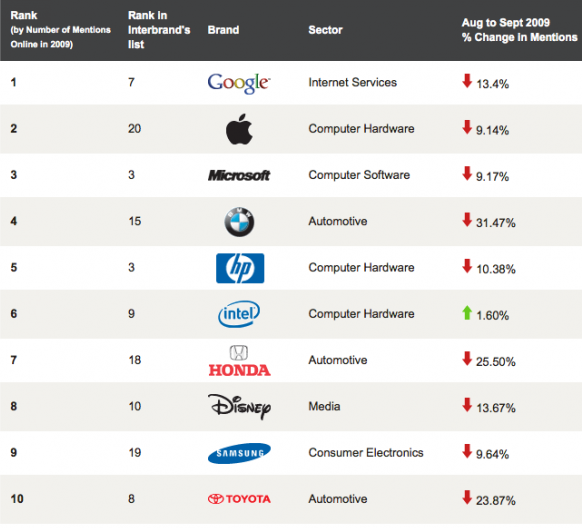 Google, Apple, and Microsoft took the top spots in the rankings, edging out companies such as Disney, Samsung, and Intel. Sysomos based the rankings on results from their Media Analysis Platform, which catalogs social media conversations and tracks the trends and sentiment contained within. Interbrand drew their rankings from criteria such as financial data, international scope, and Economic Value Added. When comparing both lists, Apple showed the biggest gain between the two, going from #20 in Interbrand's rankings to #2 in the Sysomos list. CEO Steve Jobs was named the most admired entrepreneur in a survey of 1,000 children between the ages of 12 and 17. Another survey showed that a majority of teens own an iPod, holding an 87 percent share among them. J.D. Power and Associates' customer satisfaction survey saw Apple at the top of the list, with 811 points out of 1000. Apple hopes to use this positive public and online sentiment to continue to chip away at Microsoft's share of the personal computer market. With the impending launch of Windows 7, Apple has endeavored to highlight the fact that their platform is best suited to interact with the popular iPods and iPhones in a new series of ads aimed directly at Microsoft.